Yesterday, when it was morning in the Pacific Ocean, the Space Telescope NuStar (Nuclear Spectroscopic Telescope Array) was launched and successfully entered orbit. NuStar will use a Wolter telescope, a telescope for high energy X-rays (6 to 79 keV) using grazing incidence optics. This is because X-rays can be deflected and focused only with small angles, unlike visible light. In the ’50s, German physicist Hans Wolter outlined three possible configurations to building an X-ray telescope. NuStar is equipped with two optical units of the type called Wolter-I each of which consists of 133 very thin cylindrical mirrors. These mirrors are assembled one above the other in order to focus as much X-rays light as possible. Given its small size, NuStar wasn’t launched using a rocket lifting off from the ground but by a small rocket Pegasus XL launched from an airplane L-1011 Stargazer that took off from the Kwajalein Atoll in the Pacific Ocean. NuStar, the L-1011 Stargazer aircraft and the Pegasus XL rocket are all products of Orbital Science Corporation, a veteran of space launches. In fact, the Pegasus XL rocket was tested for the first time in 1990 and in its first flight it was launched from a Boeing NB-52B “Balls 8”. Since that launch the Pegasus XL has already completed 40 missions before today to carry small loads in low Earth orbit. NuStar’s primary mission, which will last two years, is to conduct a survey of blacks holes to better understand how they work, map supernova explosions, study the nature of the most powerful cosmic accelerators and identify high-energy sources in our galaxy. 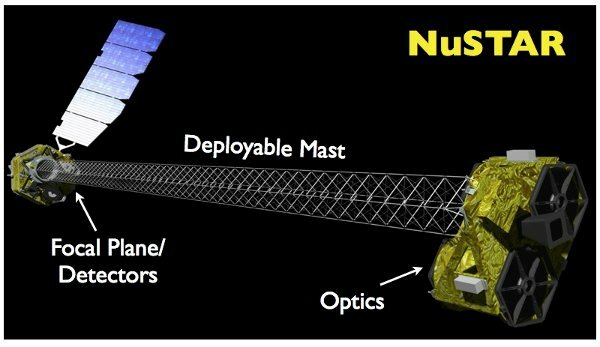 NuStar will work together with other space telescopes already in operation, including the Chandra telescope, which observes low-energy X-rays. There are still many mysteries in the universe, NuStar will help us to reveal them.